The iPhone X has a great camera but for cinematic iPhone video, you must use a gimbal. By offering stabilization, a gimbal dramatically improves your video quality. This makes it a vital tool for YouTubers and filmmakers but it also offers value to the hobbyist or family videographer. Not all gimbals are compatible with the iPhone X. Check out this guide to find out which gimbals work with the iPhone X to see which one might be a good fit for you. With the smooth and stable footage the Osmo Mobile 2 can provide, your iPhone X can be used to create video you’ll feel good about sharing. , this gimbal features built-in sensors and brushless motors that ensure stability. This is great for minor vibrations and shakes but it’s surprisingly effective for bigger and more jarring movement as well. Weighing only 485g, this gimbal is lightweight and easy to carry around. The design is fairly compact and allows for some folding, making it easy to carry around. The construction is solid and durable. A long battery life means you can shoot for up to 15 hours. You can also use it to charge your iPhone, although that will cut down on the total battery life of the unit. 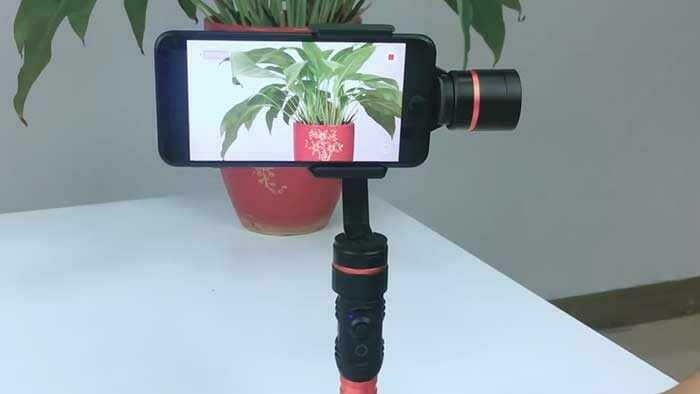 In addition to being great for recording footage, this gimbal is also ideal for live streaming video on Facebook, Instagram, YouTube or any other platform. Other features include cinematic zoom controls like dolly zoom, motion timelapse, and ActiveTrack for following a subject with ease. This gimbal works great in either default camera mode or selfie mode. 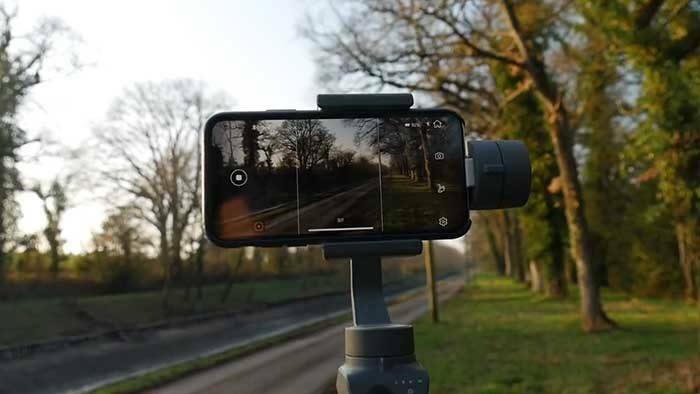 Verdict: The DJI Osmo Mobile 2 is a lightweight, compact, and solidly built gimbal that is ideal for use with an iPhone X. It offers good value and superior stabilization, letting you capture and share video easily. 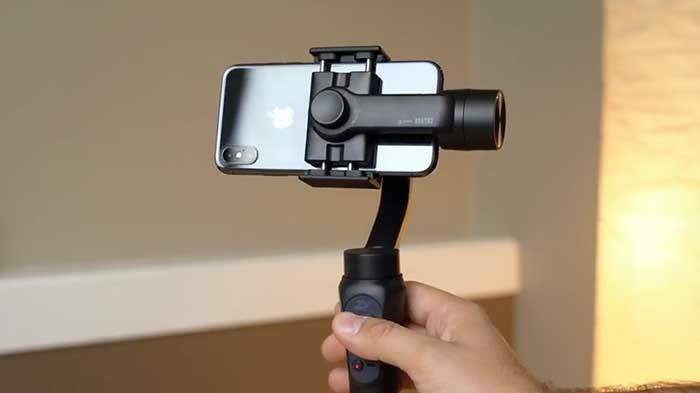 In our opinion, this is overall the best iphone x gimbal on the market currently. It’s all in the name. The Zhiyun Smooth 4 isn’t telling tales; this gimbal really does help you take silky smooth video. It has a powerful motor that lets you handle the weight of a bigger phone like the X as well as accessories. But smoothness is really just a minimum standard one should expect in a gimbal. Where the Smooth 4 really shines is in the different features and modes available. There are a number of different time-lapse possibilities including . PhoneGo Mode helps you instantly and seamlessly transfer from one scene to another. This mode responds to even small movements instantly and smoothly. With Focus Pull & Zoom capability, it’s easy to smoothly zoom in and out with a degree of precision you can usually only get with professional filmmaking equipment. What makes all of these modes and features even better is that the integrated control panel design makes it simple to switch between modes and use the different features. 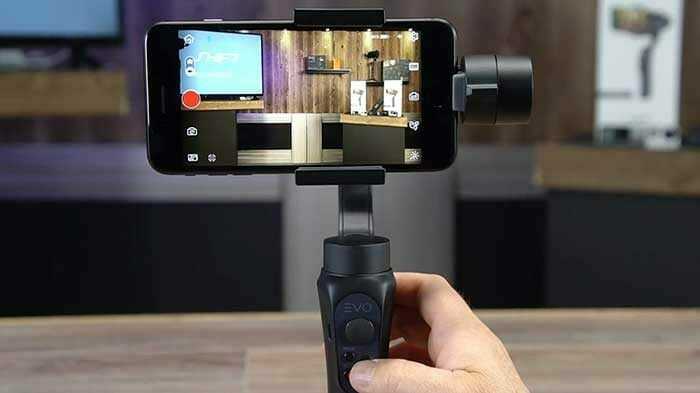 Verdict: With great stabilization and smooth motion, the Zhiyun Smooth 4 is perfectly suited to the iPhone X. It has a number of unique and very valuable modes and features. This is an older version of the Zhiyun Smooth Q. It has many of the same valuable features but not some of the special modes. One way the Q is better than its successor is that it offers a full 360-rotation. While there are only a few specialized uses where this would make a difference, it’s worth noting. The Smooth Q has a maximum payload of 200g so it might not be able to handle both the X and accessories. Like the Smooth 4, it has a long battery life of around 12 hours and does let you connect to an external power source without stopping filming. The stabilization on the Q is very good. It was one of the first smartphone gimbals to offer that level of cinematic quality in terms of the smoothness and stability it offered. Features include Auto Tracking and Timelapse mode. The ZY Play App offers some additional functionality. The app is notoriously buggy on Android but it tends to perform generally well on iOS devices. Filming with a gimbal for a long period of time can get uncomfortable, leading to hand cramping and pain. The FeiyuTech Vimble grip is molded to fit a hand and is made from materials that are both comfortable and strong. The grip also features a telescoping bar. 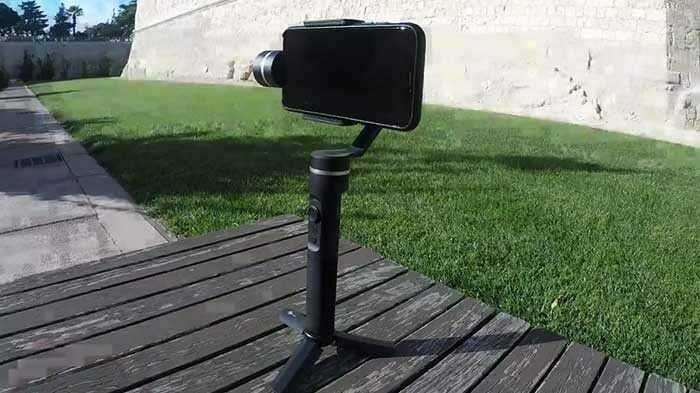 This retractable pole is ideal for selfie-mode shooting. In addition to the comfortable grip and extension pole, this gimbal stands out for offering a lot of value at a comparatively low price. It has all of the most important features and modes you’d want in a gimbal. This includes face tracking and object tracking as well as timelapse and panorama modes. Moving between modes is fast and easy, using the main trigger button. You can control the camera using your smartphone with a Bluetooth shutter and zoom option. There is also the Vicool app which supports a number of functions. Verdict: The low-cost FeiyuTech Vimble 2 is a great entry-level gimbal for the iPhone X user looking to try a gimbal for the first time. It also stands out for its comfortable grip and retractable pole. Every gimbal approaches the controls on the grip differently. The EVO Shift lets you do more right from the handle. This includes access to record and zoom controls. 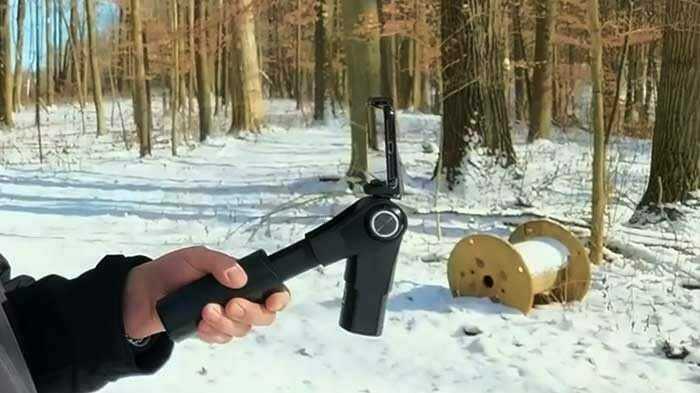 You can also easily adjust the shooting angle using the 4-way joystick. The Shift offers superior stabilization and has 3 different stabilization modes. These are Pan Follow, Full Follow, and Lock. It also has Smart-Track, allowing you to track a person or object. This gimbal also stands out for its motion timelapse feature, letting you set sweep points and a time range to capture time in a stunning way. For those wanting to do a lot of live-streaming on social media, the bi-directional mount might be helpful, letting you shoot in either portrait or landscape. It’s also easy to go live on Facebook and Instagram right from the Evo App. The battery life on the Shift isn’t quite as long as some gimbals, but the 10 hours it gives you is nothing to sneeze at. It also does give you the option to charge your phone. 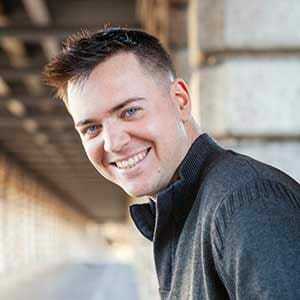 Snoppa is a relative newcomer to the gimbal market and they hit the scene with a bang. For a very reasonable price, this gimbal is trying to compete with the big boys. They claim that it’s the world’s most advanced three-axis gimbal. Ultimately, this gimbal operates differently than other gimbals on the market. It uses no motor arms or extra weights and instead relies on powerful hardware, built-in motors, and its proprietary algorithm. You can start shooting right out of the box with this gimbal as you never have to take time for mounting or balancing. There are three stabilization modes: pan, lock, and omni. In addition, you can change shooting angle and tilt angle. It’s easy to take smooth and beautiful 360-degree videos. It offers rotation timelapse shooting and multiple exposures as well. Another way this gimbal is different is the design sensibility. This is a sleek model. It looks as high-tech as it purports itself to be. The Polycarbonate shell and the sleek, compact design just looks nicer than many gimbals. It’s also extremely durable. In fact, Snoppa describes it as decidedly “NOT delicate” so this is a gimbal that can handle a fast-paced life of shooting on the go. Verdict: The plug-and-play Snoppa M1 is a bold entry into the smartphone gimbal space. It stands out for its minimalist design, for changing the foundational tech in most gimbals, and for offering great value for the price. For those who prefer to use a joystick controller on a gimbal, the Hohem T2 is worth considering. It features an intuitive 5-way joystick controller, giving you a lot of control. This gimbal is solidly built and has a fairly comfortable grip. It’s not waterproof but it is water-resistant, making it a good option for those who shoot a lot during snowy weather or at the beach. Among the features and modes available with the T2 are face auto-tracking, automatic panorama, and time-lapse. It also features the standard stabilization modes one expects in a gimbal. A faster and more accurate response is something that makes this gimbal special. You can also easily switch to vertical shooting if desired. Verdict: The Hohem T2 has the potential to be a very good gimbal for iPhone X but it is a bit overpriced and lacks the amount of social proof other gimbals have. The Dobot Rigiet would be near the top of a lot of lists if it weren’t so overpriced. Other gimbals offer everything that it does for much less. It does offer fast response time with smooth and stable motion. You can shoot in standard, vertical and upside-down positions. It can create very nice motion timelapses. It’s easy to livestream directly on social media. There is auto-tracking for people and objects. It does have very good battery life and will allow you to charge your phone. Shooting around water offers a lot of possibilities but it’s always risky to potentially damage your tech. If you like to shoot around water, a splash-proof gimbal is definitely worth looking at. This gimbal from Feiyu is fully splashproof. In addition, it offers Smart Face Tracking and all of the stabilization modes you’d expect. The controls are intuitive and easy to use. The SPG offers decent battery life but it also stands out for including an extra battery. That means you can have a charged one ready to go to pop in when the other one runs out of juice. Verdict: Feiyu has long been a leader in the gimbal market and the Feiyu SPG is a standout for offering fully splash-proof technology. Can I use an external microphone with any of these iPhone X gimbals? Yes, most gimbals on this list will work well with an external microphone. With any gimbal accessory, you just have to be mindful of its weight since all gimbals have a maximum payload. 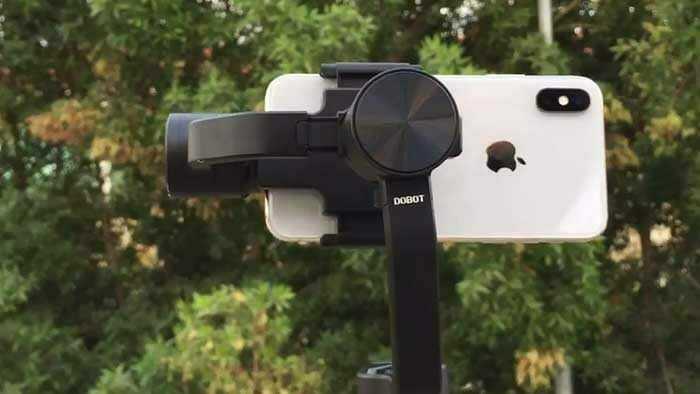 Most external microphones are relatively lightweight, though, so for the majority of these gimbals using your iPhone X and an external mic will be no problem. Of course, you should be aware that there is no jack on the iPhone X, so you should . Any tips while using a gimbal with FiLMiC Pro? 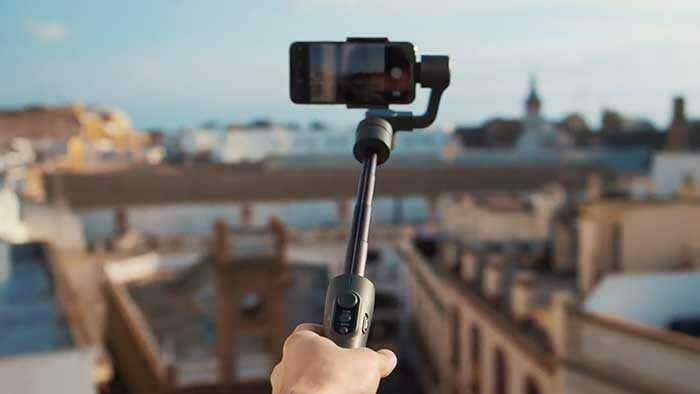 The best gimbal on this list for using with FiLMiC Pro is the DJI Osmo Mobile 2. It lets you adjust elements of FiLMiC Pro right from the gimbal itself. To get the most out of both your gimbal and FiLMic Pro, my top tip is to buy the DJI because it just makes it easier. That said, the other gimbals (with the exception of the Zhiyun Smooth Q) can be used with FiLMiC Pro. 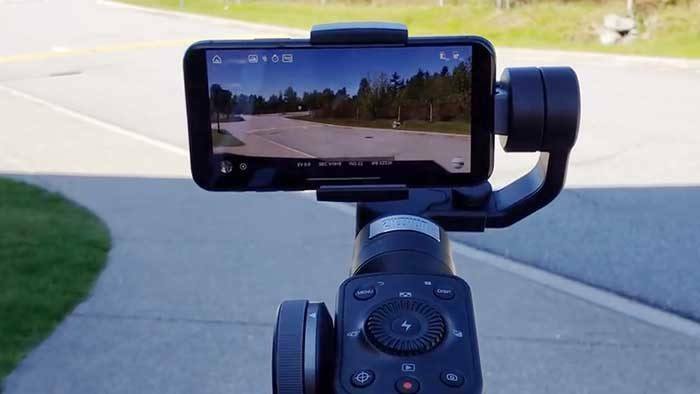 This video offers some good tips for using FiLMiC Pro with your iPhone and your gimbal. Should I disable OIS (Optical Stabilization)? Generally, you will want to disable the OIS on your iPhone X. That’s because the OIS and the gimbal’s stabilization will be fighting against each other. Unfortunately, there is no way to directly disable OIS on your iPhone. The competing stabilizers often lead to added shakes. It will also cause the battery of both devices to wear down more quickly. This is where FiLMiC Pro comes in handy. You could also potentially use a magnet to lock the OIS in place, as demonstrated in this video from EVO Gimbals. Hi i have a question, I want to shoot a 30 day timelapse with an iphone and a gimbal. Will i be able keep both the phone and the gimbal charged and functional with any of these? Would really help thanks.